In the event that we find the answer to immortality, could we harness its powers and really learn to live forever? Maybe it would be as simple as making a cup of tea! There have been many herbs, plants, and foods that have been used to brew longer life span concoctions. Recipes from ancient times until now have listed hundreds of ingredients that supposedly formulate the elixir of youth. Unfortunately, most of these spells, potions and concoctions were merely ideas. Some did nothing at all! So, is it possible? Have we found the answer to what we seek? Voila! Introducing Chaga, the “magic mushroom”. This nontoxic fungus grows on Birch trees in the northern climates of various countries. When you think of mushrooms, you may think of the soft spongy version, dappled with gray, brown and white colors, but this is not what Chaga looks like! This fungus closely resembles a chunk of burned wood or charcoal, yucky huh. Despite its rather unattractive appearance, its benefits are quite lovely, so it doesn’t really matter how “yucky” this miracle fungus appears. In many countries, this curious mushroom hails a unique name. In Siberia, it is called “The Gift from God”, and “The Mushroom of Immortality”, in Japan it is considered “The Diamond of the Forest” and in China, this strange mushroom is simply referred to as “The King of Plants”. This mushroom does grow in the northern climates of North America as well, but is recognized by its given name, “Chaga”. Among the Birch trees, most Americans are simply unaware of this miracle plant’s existence! Do you want to know what makes this mushroom so potent? Chaga has a long list of ingredients and benefits that may astound you: Amino Acids, Vitamin B1, B2 and B3, Phenols, copper, Chloride, Magnesium, Melanin, dietary fiber, calcium, Iron, Manganese, germanium and the extremely beneficial Betulinic Acid. There are many more vitamins and minerals within this magic mushroom, including antioxidants. In fact, Chaga has the highest level of Antioxidants and Superoxide Dismutase (one of the body’s primary internal anti-oxidant defenses) of any other food! If all those ingredients and nutrients didn’t blow your mind, think about this! Chaga holds the life force of TREES! It is well known that some trees can live for thousands of years, and Chaga harnesses this life force within. However, one of the most important aspects of Chaga is Betulinic acid, found only in Birch trees. Among the many health properties of Betulinic acid is the ability to provide anti-tumor formation and growth properties. .Chaga is considered an Adaptogen. This means it has the ability to increase the body’s ability to handle stress and anxiety. I think everyone needs to harness this ability! .“The Magic Mushroom” is a natural antibacterial, inhibiting or completely destroying the reproduction and growth of bacteria. .According to a study called The Pharmacological Potential of Mushrooms, Chaga can greatly lessen the symptoms of HIV. .Chaga also hails the ability to lessen pain and act as an anti-inflammatory. This is great for those who suffer from various forms of arthritis. .Chaga also helps process Candida toxins, protecting the Liver. .Other benefits include treatments for hair loss, asthma, diabetes, Crohn’s Disease and Psoriasis. With all that being said, we know that the Chaga mushroom is something we want to get our hands on. But wait! You must be very careful when harvesting this mushroom as to the delicacy of the Birch tree. IF you cut too deeply within the tree to retrieve the mushroom, you could actually kill the host. You must also pay attention to all the characteristics of the Chaga mushroom to insure you find the right crop. 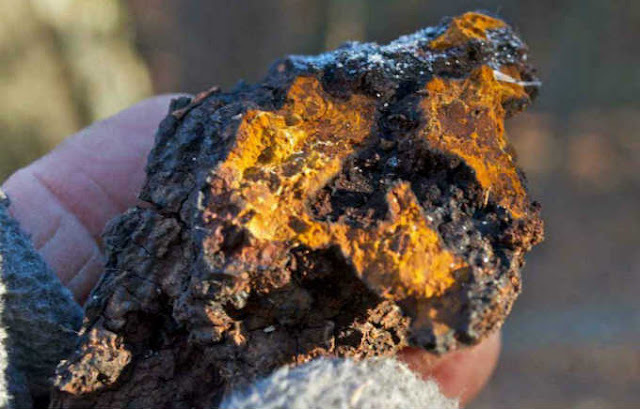 The Chaga mushroom, as stated before, will resemble a piece of burned word or charcoal. Inside the mushroom, you will find a golden orange color. If you are unsure about what you have found, do plenty of research. One of the most popular ways to consume the Chaga mushroom is through brewing tea. Only a few small pieces of the mushroom are needed to do the trick. Cover the pieces of mushroom in 2 liters of filtered water and cover. You can bring your concoction to a boil and then simmer for an hour. After that, add another liter of water to the tea, returning to a simmer for another hour. After this process is completed, and it is time-consuming, you can enjoy your Chaga tea. The tea will have a vanilla black tea flavor that can be consumed with or without sweetener, and the benefits will be well worth the wait! Not only will you be able to enjoy a soothing cup of tea, you will also feel confident that you are well on your way to longer life – a healthy, energy filled life as well!